I am sure you have seen it everywhere. It seems every season more and more people are making it. With good reason. It is sweet, buttery, crunchy and just spectacular! You may have seen it made with saltines, and it is fantastic. That little hit of salt and the flakiness of the crackers is perfect. But there is just something about graham wafers I can’t resist. The flavour is one that takes me back to my childhood and one that I still love today. 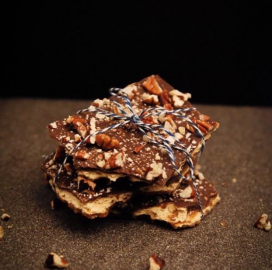 Graham Wafer Toffee is quick, very easy and fairly inexpensive. You can substitute saltines for the graham wafers and change out the type of nut used on top to one that your family enjoys! Line a cookie sheet with parchment paper or aluminum foil and lightly spray with non stick spray. Arrange the graham wafers with sides touching, covering the entire surface of the cookie sheet. Add the brown sugar stirring to combine. Cook and stir the mixture until it comes to a boil. Pour the hot sugar mixture over the graham wafers. Bake at 350 for 6 minutes or until bubbling. Sprinkle the chocolate chips over the surface of the bubbly brown sugar. Allow the chips to soften for a few minutes. I like to cover the cookie sheet with another cookie sheet to help retain the heat and melt the chips. Once the chocolate chips are shiny they are soft. Using the offset spatula spread the chocolate to completely cover the buttery sugar layer. Sprinkle with the toasted chopped pecans and allow to cool fully.